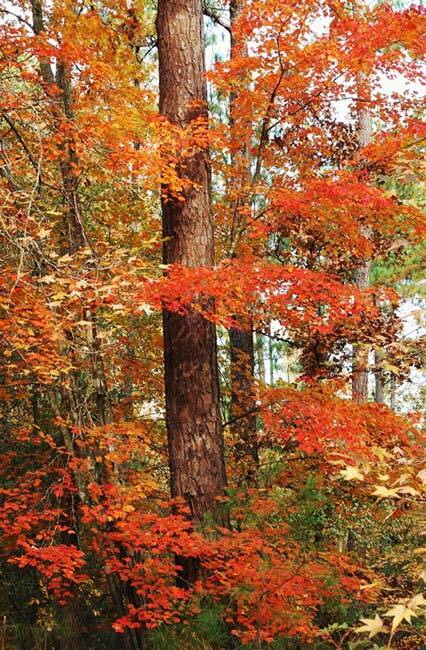 Harbison State Forest is an urban oasis within South Carolina’s capital city of Columbia. Spanning 2,137 acres, the forest stands along the Broad River and was originally settled by Catawba and Cherokee Indians. The land was purchased in the early twentieth century by the Harbison Agricultural and Industrial College, founded in Abbeville in 1885 as Ferguson Academy, an agricultural school for African-Americans. In 1891 the Board of Missions for Freedmen of the United Presbyterian Church assumed the title and operations of the school as part of its effort to train leaders in the black community. One of the board members of the organization was Samuel Harbison of Pennsylvania, who also donated 200 acres of land for the school as well as funding for a building. The school then changed its name to reflect its benefactor. Throughout the twentieth century, the school continued to acquire land, eventually moving from its original location in Abbeville to a more rural site in the town’s outskirts and finally, to Irmo in 1910. Sadly, the school burned several times over the course of its operation, including in 1910. Three students were killed in the 1910 fire, which was started with kerosene and likely racially motivated. The school continued to rebuild and acquire land, however, including the acreage that is now Harbison State Forest. Much of the land was intended to be sold to families at low prices by the Board of Missions for Freedmen of the United Presbyterian Church to assist tenant farmers in establishing homesteads. After the school burned again in 1941, it rebuilt as a boarding facility and began selling off land to stay afloat and eventually expand. By 1951 the school, still operated by the Board of Missions for Freedmen of the United Presbyterian Church, sold more than 2,000 acres to the South Carolina Forestry Commission for use as a state forest. The contract of the sale stipulated that the forest keep the name Harbison to honor benefactor Samuel Harbison. The forest was developed in 1981 for recreational use as well as environmental education, including forest management. The forest is 40% loblolly pine (Pinus taeda), 40% longleaf pine (Pinus palustris), and 20% bottomland hardwoods. Eighteen miles of trails wind through the forest, allowing for walking, running, and cycling. An Educational Center helps guide visitors through the natural history of Harbison State Forest. The Harbison Agricultural and Industrial School, which was called Harbison Junior College in 1946, closed in 1958 after rebuilding in response to yet more fires in 1952 and 1953. Today site of the former school is the location of the Harbison Campus of Midlands Technical College.